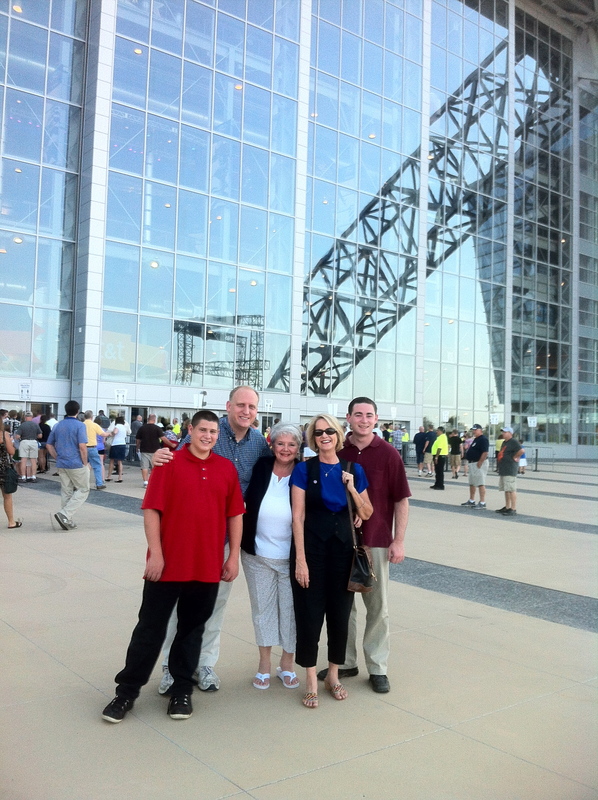 At Cowboys Stadium for Restoring Love event, Saturday, July 27, 2012. Left to right: Chris LaCombe, Joe Wierzbicki, Andrea Shea King, Elizabeth Letchworth, Ryan Gill. While I was in Dallas last weekend with Elizabeth Letchworth to participate in Glenn Beck’s Restoring Love three-day event, we stayed with members of Elizabeth’s family. Elizabeth’s niece Marina, a poised, bright, home schooled 17-year old, attended the Saturday night event with us at Cowboys Stadium. She was accompanied by her dad Alan and mom Mariana (Mom is also a published writer) and her two sisters Karista and Ellie. Karista took the photos that illustrate Marina’s piece in today’s American Thinker. To say I am impressed by Marina’s perceptive understanding of what Restoring Love was REALLY about would be an understatement. Marina nails it, bringing the pieces together in a way that would impress Glenn himself. She totally “got it”. Also, appreciate Marina’s writing style — that of someone with a maturity level not often seen in public-school educated teens. Read “For Whom Beck’s Bell Tolls” and see for yourself. I expect if you were there in Dallas last weekend, you’ll agree with Marina’s observations. And those of you who were unable to attend? Well, this will enhance your understanding of just exactly what it is that Glenn Beck and his team are trying to accomplish… and did so in spectacular fashion with the final trio of events emphasizing Faith (Honor), Hope (Courage), and Charity (Love). The Continental Congress Bible is probably the first one printed in English in the Colonies. This is importnant. However, for several decades before, the Bible had been printed in German. Most of us don’t realise this. I suppose that this was because the German Bible did not involve Crown Copyright as the English AV/KJV did and does to this day in England. I have no idea of any restrictions on importing during the later 18th c. However, our Congress did think it wise and well to arrange a printing. This helps set the notion of ‘separation of church and state’ in proper context. Just a historical note that Glenn would appreciate. Andrea, my wife and I, including my 17 year old were their last week also. I was also impressed with my daughter’s reaction to that event, and the other events we went to that week. They included the day of service. (the 3 of us assisted at a facility with physically and mentally handicapped adults). My wife and daughter worked directly with the adults, while I helped with the crew that painted all the metal rails outside. We also attended FreePAC. I also had a chance to get over to the Arlington Convention Center to listen to some of the talks from some of the preppers that I subscribe to on YouTube and the ‘net. (Jack Spirko of “The Survival Podcast and SouthernPrepper1). All in all, a very rewarding week. Wish we could have met there in person. So glad you had a fulfilling time. Glenn’s awesome, isn’t he? And so are all those who came out to Restore Love! This is something your 17-year-old will never forget. A watershed moment in her life! Actually, in our lives too!